Will Global Slowdown Support Gold, or Is It Just Temporary? Mayday, mayday, we are sinking! The global economy is slowing down. How serious is the current slump? We invite you to read our today’s article about the true condition of the world’s economy and find out what are its likely implications for the precious metals market. Economists and market analysts often make volte-face. We remember that in 2018 the pundits were heralding the synchronized global growth. One year later all the talking heads prophesy the synchronized global slowdown. What is happening? How serious is the current slump? And what are the implication for the precious metals market? Well, it’s true that the global economy did not start 2019 the best. Stock markets plunged, while the American government was temporarily shut down. Global manufacturing activity has slowed down. The export-oriented economies, such as Germany and Japan, were particularly hit. But even the US industrial production fell in January. What happened? It might be tempting to blame president Trump and his trade wars. After all, the slowdown in production began when Trump raised tariffs on washing machines and solar panels. However, there are more factors contributing to the current slowdown that US trade policy. China might be actually the key. To see why, let’s go back in time to 2015. In that year, Chinese leaders tried to open the country’s financial markets and to deleverage its economy, after all the stimulus added in the aftermath of the Great Recession. It did not end well – the stock prices collapsed, triggering turmoil in the global stock markets. The downturn was quickly stopped as the People’s Bank of China eased its monetary policy while the government ballooned its fiscal deficit to about 15 percent of GDP at the beginning of 2017 (we refer here to Goldman Sachs’ estimates of true budged deficit, which is – surprise, surprise – significantly bigger than the officially reported by the government). Then, Chinese leaders focused again on deleveraging the economy. As China decided to limit excessive indebtedness, the budget deficit decreased, but domestic demand weakened. Hence, the global growth’s acceleration in 2018 was partly caused by China’s easy monetary and fiscal policy, while the global growth’s slowdown in 2019 was partly caused by the China’s struggle to reduce its debts. The anti-leverage campaign sank Chinese stocks, hit the shadow-banking industry and restrained economic growth. What is important here is that China has started again to focus on growth rather than on indebtedness. The PBOC has cut banks’ reserve requirements in January by 1 percentage point, after four previous cuts in 2018, to free up more funds for lending. And regulators told big banks to increase loans to smaller firms by more than staggering 30 percent, despite all the risks. So, it is not surprising that China’s credit growth and total new bank lending hit a record in January. The authorities will also add fiscal stimulus, as the government pledged support of over $300 billion including lower fees, tax cuts and massive infrastructure spending. The fresh stimulus may, thus, stop the global slowdown, or soften it at least. The fact that China unscrewed taps with money again is another argument against the belief that global recession is just around the corner. Given the developments in China (and the likely end of trade negotiations between China and the US), the current slowdown should be temporary (however, it will take a few months to start feeding into the global economy). This is not good news for the gold market. The recession or deeper downturn could help the yellow metal to shine. Moreover, if the global economy accelerates in the second half of 2019 or in 2020, the Fed could end its pause and deliver further interest rate hike. However, the current stimulus is so far weaker than the previous one. It suggests that the global economy will not replay the synchronized growth of 2017-2018. The China’s stimuli may rather provide a soft landing after the deleveraging campaign and after the waning effects of Trump’s fiscal stimulus. Look at the chart below, which shows the M2 money supply for China. We do not have data for February, but the Red Dragon has just stopped the downward trend. If it really wants to reflate the economy, there is still a lot of work ahead of China’s printing press. But if the data confirms press reports and we will see a further easing of monetary and fiscal policy, then we could see a replay of 2015. And this is not necessarily positive for gold. 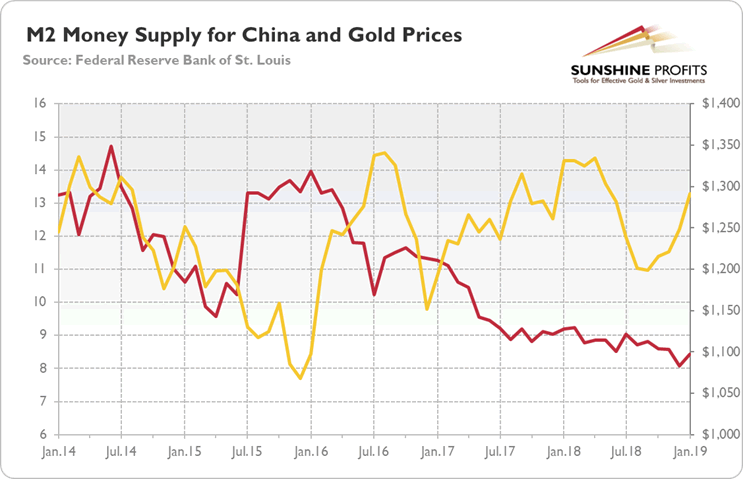 As one can see in the chart above, the surge in money supply in China in 2015 coincided with the plunge in the price of the yellow metal. Investors have so far welcomed the softer credit conditions and easier fiscal policy in China. But the debt-fueled bonanza will not last forever. And when it stops, oh boy, the world will suffer. The China’s demand for investment goods will drop (poor Germany) and the country will not be able to add another stimulus and pull out the global economy from the downturn. Then, gold should shine.